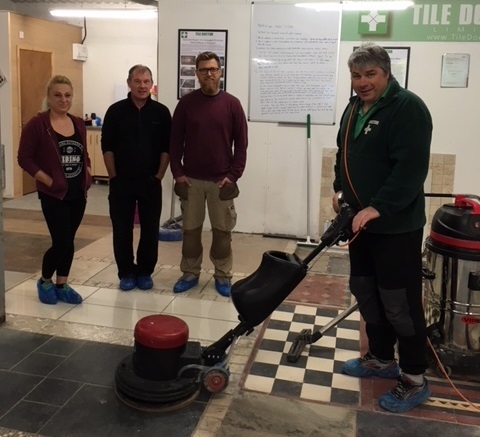 Two Day Training Workshop held at our centre in Lancashire where you will discover how to clean, strip and seal Tile, Stone and Grout. Have you or a member of your team ever used Viakal or Cillit Bang to remove limescale on natural stone? Here at Tile Doctor we often receive requests from customers where their agency cleaner has used the wrong product to clean their tile and stone with disastrous results. This one day course is aimed at Agency and Contract Cleaning companies who need to ensure their staff are aware of the pitfalls when it comes to maintaining Tile, Stone and Grout. As with all our courses the training is 95% hands-on and held at our purpose built 120m2 training workshop near Lancaster which has been fitted with the most common types of Tile and Stone in use in the UK. The course starts with an overview of the different types of tile and stone typically used in the UK before moving on to different cleaning techniques, which cleaning products to avoid, being aware of sealers and of course practical hands on training cleaning many different types of tile and stone.